PERTH is said to be the world’s most isolated capital city, closer to Singapore than it is to Australia’s capital, Canberra. One thing is certain – despite its distance, every Australian and visitor to our country should spend at least some time in this glorious city. Ever booked a beach holiday but it turned into a holiday on the couch because there was hardly sun? Weather is unpredictable but Perth has more sunshine than any other Australian capital city, so you could visit Perth at almost any time of the year and you’re likely to enjoy plenty of outdoor activities. Perth enjoys 3000 hours of sunshine a year (8.8 hours each day on average) and summer sees temperatures remain around 30 degrees celsius. Facing the Indian Ocean, Perth is within close proximity to several gorgeous beaches. The crystal clear waters at Cottesloe Beach, about 15 minutes from Perth’s CBD, is a popular spot for snorkelling and swimming (and stopping in at one of Australia’s best pubs, the Cottesloe Hotel). You can also find you’re own little quiet spot at one of the many smaller beaches just outside of Perth. Just 30 minutes east of Perth city is the historic Swan Valley. Here, you may visit a winery to taste some of Perth’s premium wines or head to a boutique brewery. You’ll also find original gourmet food throughout the valley’s numerous restaurants and cafes, while chock-a-holics can enter a world of chocolate at the Margaret River Chocolate Company’s factory in Swan Valley. 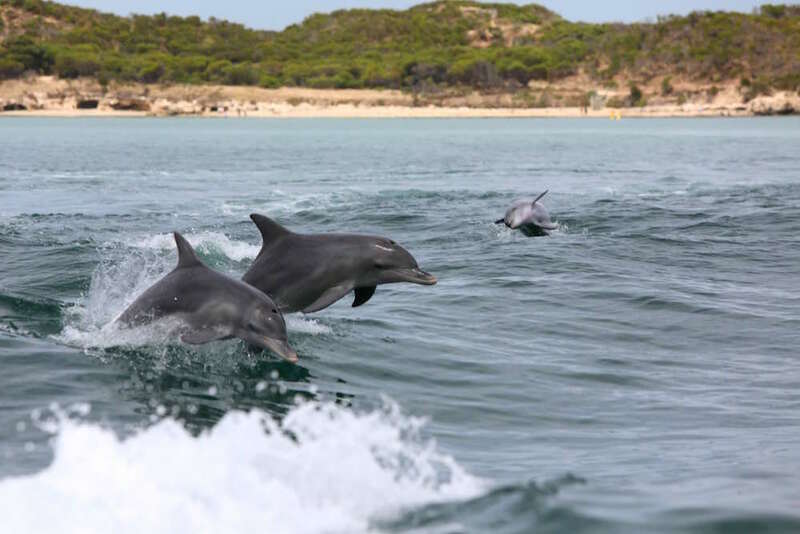 One of the highlights of a weekend in Perth is swimming with dolphins – wild ones! Between September and June, Rockingham Wild Encounters takes travellers out on a boat and into the ocean to swim with these gorgeous animals. This company has won several ecotourism awards and there are few other places in Australia where you can swim with wild dolphins. Photo: Scott Podmore. Just a short ferry ride from Perth is Rottnest Island, home to white sandy beaches and crystal clear waters. No cars are allowed on this natural paradise, so most people cycle around the island. Look out for the adorable, smiling quokkas – these cute creatures are found throughout the island. Markets across Perth sell everything from handmade crafts to organic produce. every weekend. Western Australia’s largest undercover market on Sundays, Canning Vale Markets, operates 7am to 2pm. It has over 1,000 stalls selling new and second-hand furniture, clothing, books, toys and war memorabilia. You can pick up some colourful rugs and pottery at the Station Street Markets, which run Friday to Sunday, 9am to 5.30pm. There’s also the Perth City Farmers Market every Saturday morning, where you’ll pick up bargains from growers who farm ethically and sustainably.